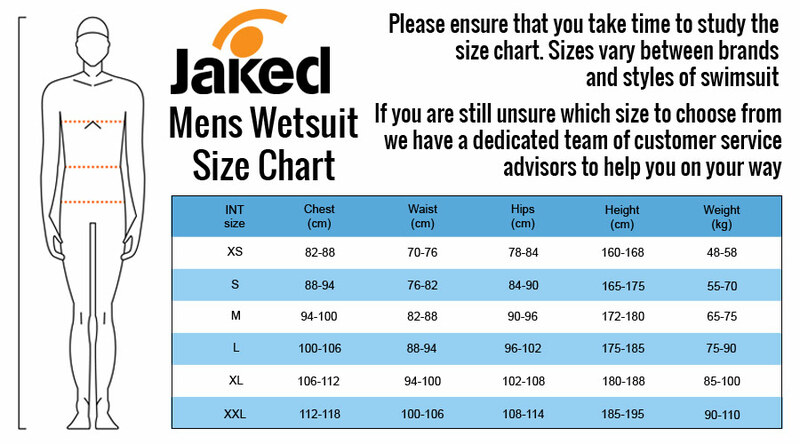 The mesmerising Jaked FFWW Men's Wetsuit brings together the wealth of expertise of both Jaked and Salvimar in elite performance wear and triathlon. The result is a one-piece technical wetsuit that offers superior water flow, flexibility and levels of comfort. The FFWW is strongly recommended for all aquatic sports in warm water, where freedom of movement is a priority. An inside stretch lining for the underarms, calves and arms delivers a unique elasticity and smoothness for extensive use. The 2.5mm middle density neoprene with an elastic and compact lining, is high-stretch for uninhibited breathing and range of motion. It has also been specifically treated to enhance the natural smoothness of the neoprene and to boost its excellent anti-scratch surface. The professional hard-wearing zipper delivers excellent resistance from torque stress for the most robust of use. All this and a fascinating, curving paint-splash design in scarlet and bright white, to complete its quality appeal. Please See Full Features Below. Strongly recommended for all aquatic sports in warm water. Ideal for both training and performance wear. Fascinating scarlet and white paint splash design with exceptional detailing. Tessuto technical neoprene with hard-wearing, scrape resistance. Smooth, high-stretch lining in the underarms, arms and calves for unique elasticity and ease of wear. About: Jaked’s relatively recent arrival on the swimwear scene in 2008 with the "Super-body J01”, transformed elite swimming and set unprecedented performance standards. Their ethos of research, development, proto-typing through to extensive testing, has now been used to superb effect in their Triathlon range. Their extensive collection is engineered to equip every triathlete and open water swimmer for the challenges ahead.